An Islamic cola company that was launched as an alternative to multinational drinks firms has gone into receivership. 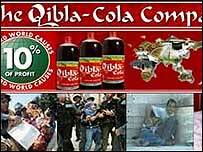 Derby-based Qibla Cola Company was set up in 2003, promising to donate 10% of its profits to charity. It followed the overseas success of Zamzam Cola, an Iranian-made drink named after a holy spring in Mecca, and France's Mecca Cola. But bosses said it had been affected by bottling and distribution problems. The company launched a range of soft drinks. Earlier this year it signed an agreement to distribute its products in Libya. They were also sold in Canada, Netherlands, Norway and Pakistan.